The Horsehead/Flame Nebulae combination is a favorite target of astro-imagers and is found in many gallery collections. Located near the bright star Alnitak , the easternmost star in Orion's belt (seen in the above photo just above the Flame Nebula), the Horsehead portion of this lovely object was first detected photographically by Mrs. W.P. Fleming of the Harvard College Observatory on June 27, 1888. 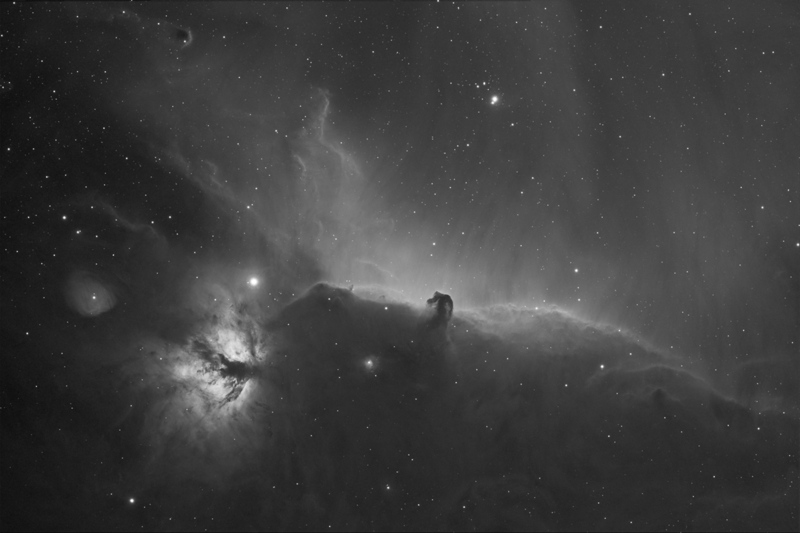 The shape of the Horsehead and the dark lanes of the Flame are the result of clouds of interstellar dust obscuring the light of moderately bright nebulae behind them. This famous pair lies about 1500 light years from Earth and is a known, active stellar nursery. I've imaged the Horsehead/Flame on a number of occasions but never felt the final product was worthy of posting on my website. This is the first image of it, taken with the Astro-Physics 160 EDF refractor, that I believe begins to capture the exquisite beauty of this object.